Native to Mediterranean regions, the King Oyster is the largest of the Oyster mushroom species. This ingredient can be prepared in a variety of ways- from grilled to stewed to sauteed. The King Oyster mushroom, distinctive in shape, can serve as the real star of a dish. Often used in Asian cooking, it has a thick and meaty stem. Flavorless until cooked, these mushrooms offer a nice umami flavor to the dish. 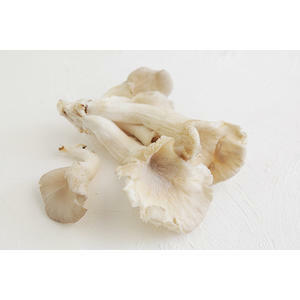 King Oyster mushrooms have a long shelf life and are hearty and stout in texture. Chef Tip: A thin, crosswise slice makes King Oyster mushrooms less chewy because its fibers run the length of the mushroom. Mushrooms are a healthful addition to any meal. Low in calories and high in protein, they are the perfect combination between meaty texture and plant-based nutrient benefits. Oyster mushrooms are also a good source of fiber, B vitamins, phosphorous, potassium and copper.